Laura Popoviciu, a 24 year-old Romanian studying at the Institut Francais de la Mode, won Gucci’s design competition to design an environmentally-friendly bag. The bag made of white canvas with nickel-free hardware and removable bamboo handles will be sold by the company as a debut design. 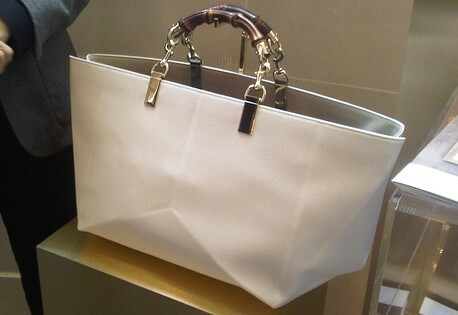 The continued beauty of a bamboo handle, long a brand identity feature of Vintage Gucci Handbags, is showcased here. The original design idea was to take the handle and put it on a variety of colored bags. Our guess is that GUCCI didn’t see the long term profitability and pricing of selling canvas, itself not a “luxury” fabric so their interest was just in showcasing their friendly nature towards green items. Their commitment remains to be seen, but, it is certainly worthwhile and encouraging to our VERTE editors. After all, its still a luxury item that travels well and will appeal to the Hollywood set, we can see next spring and worldwide Gucci Fans who want to take part in Green initiatives in the luxury sector. For our money, its a handy bag, indeed.